Whether you use it once a month to pay bills or every day to blog, your home office needs to be inspiring and efficient. Finding a nook within a small home to create an efficient yet inspiring home office can be a challenge but also a necessity of small house living. We re-imagined a small "dead" space (too small for cabinets but too big to be wasted) in our kitchen into a chic and compact home office that is grounded in a calm greige color scheme (which makes me feel organized no matter how disorganized I am), full of re-purposed objets d'art from travels and architectural artifacts that inspire me, and maximized on efficiency with a bookshelf and inventive storage solutions. Architectural pediments salvaged from a dumpster (which means free!) frame a custom bookcase, and artfully define the space. Grey graphic contact paper scored from TJ Maxx for $4 lines the back of the bookcase and provides a dramatic (and easily removable) contrasting backdrop. An antique French bistro table provides a compact work surface with chipped enamel character, evidencing its former social use. Sitting at my "desk", I can imagine all of the wonderful meals and conversations that took place over the bistro table and, for me, this is the ultimate inspiration. Re-purposing discarded objects provides visually pleasing utilitarian office storage solutions in our petite office - an old glove form corrals post-it notes, a vintage trophy picked up in Ojai holds paint brushes, and an antique leather binocular case from Paris offers scissors and rulers. Laduree boxes add pastel energy to the otherwise grey monotone space and hold paper clips, cords and ink cartridges. As for the unsightly necessity of a modern printer, I tucked it away into a seagrass Pottery Barn Beachcomber Lidded Basket. 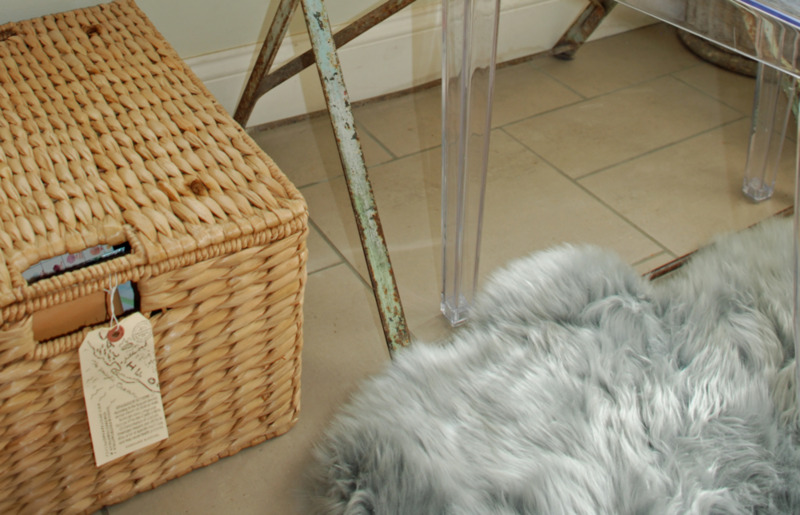 Not only is the basket an aesthetically pleasing solution but it offers a rough texture to the space that is the yin to the grey sheepskin's soft yang. A Kartell-style Louis Ghost Chair (found on sale at HomeGoods for $80) adds the functional necessity of a chair without adding too much visual weight to the compact space. Harry Bertoia wire chairs would be another great option to keep the airy feeling. Create a space that inspires you. For me, that means being surrounded by calm colors and mementos from travel (and, well, anything French is my muse). For others, that could be something totally bright and boho, or modern and crisp. Location and Light. Consider traffic flow and natural light exposure. Tucked in a corner of our kitchen that is flooded with light from two large picture windows, my cozy home office provides me with the space and quietness from the house traffic that I desperately need to withstand distractions. Do you work best in a quiet moody space or a lively bright space? Accessibility of Storage. Keep the daily items within easy reach. Nothing is more inefficient than constantly searching for a pen and paper or the electrical cord that you need for your tablet, camera, printer, etc. Form Need Not be Over Function. Home office décor should complement the adjacent rooms of your home, rather than being a soulless white box of desk and storage. For example, my home office echoes the colors of the kitchen cabinets and seamlessly bleeds into the adjoining kitchen. Creative accessories (such as vintage trophies for a pencil holder and Laduree boxes for small storage solutions) and artistic pieces (which could be your kids' framed artwork, a modern graphic or a classic painting) enhance the comfy feeling of an office. If you have the space, a settee or love-seat are ideal. The more comfortable you are in the space, the more likely you are to use it. Master Modern Technology. Beautifying the necessities of a computer and printer may be impossible, but you can hide the unsightly device or cords. Make sure to store the equipment near an outlet for easy access. Hide the device in a basket or the cord with a fabric cord cover (such as Pottery Barn's Basic Cord Cover), and contain cords with velcro ties (found at almost all hardware stores).